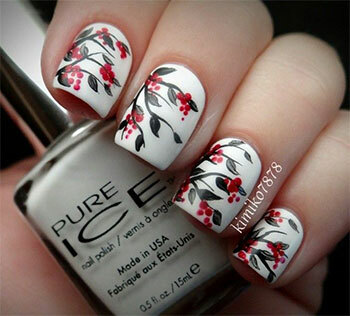 Check out these super awesome 15 winter inspired cute nail art designs that are bound to look sizzling hot this January! We are in the coldest month of the year and I have been going gaga over all the beautiful white, gray and blue nail art designs that are inspired by the winter’s intricacies. Covering yourself from head to toe isn’t all that you need at the start of a great year. Do you? I have been sporting an awesome snowman and my nails have never looked so pretty! You must also accessorize your nails with a ring or two. Gold with a brighter color and silver with a lighter one is bound to add glory to your pretty well moisturized hands. So, this time, make sure to take good care of your nails and hands. After all, they are meant to be flaunted with a lot of oomph. 2. Glittery nail art design: Extremely festive and full of sparkles, in fact, I would say, perfect to brighten up an otherwise dull and boring winter morning. Zuri suggests applying a layer of glitter as French tip. 3. Floral nail art design: You get to paint your favorite flower in your favorite color. Add a bit of rhinestones to create a 3-D effect. This one design is like painting your nails in an arty way. What an awesome way of cheering yourself up first thing after waking up on a January morning. 1. Avoid your nail tips from getting chipped by applying a couple of base coat layers. 2. To ensure the mess around your nails (on the edges, where skin is) stays clean, apply Vaseline before you start to paint them. 3. If you want your nail color to pop, use a base coat of white nail polish. 4. Use a tweezer (with sharp points) to place tiny nail art accessories like rhinestones on your nails. If that doesn’t work, opt for a toothpick. 5. Now this one can get tricky in winters, but its quick. If you want your nail polish to dry super-fast, soak your nails in ice water after painting them or better still, use a hair dryer! Here is hoping that this winter, you have been inspired enough to be able to identify one such thing (could be a flower growing in your garden or your preferred winter vegetable for that matter) that you will wear on your nails with a lot of ease and style. Have fun with your nails! ← Zuri wishes you a Happy New Year!